The exhibition The Great Tidal Wave Played a Final Tune on this Piano by Euan Macdonald was launched at Galleria S.A.L.E.S in Rome yesterday. The spectators are not only invited to be captivated by the visual stimulus. Euan Maconald draws attention to the historical significance, thus consequence, of sound. When two senses are moved simultaneously, the viewer is intuitively invited to reflect on the importance of visual and oral interplay. “To crudely paraphrase traditional information theory, noise is an interference or error in the transmission of a message…..beginning as a kind of music video that highlights the piano’s capacity to produce industrial grade noise through a maddening, repetitive, mindless, arrhythmic and atonal pounding of its keys, it ultimately leads us to reflect on the intimate relationships between information and noise, order and disorder, on which the novelty of art depends.” Ralph Rugoff, Director of the Hayward Gallery, in his essay “Responsiveness Testing.” from Macdonald’s book 9,000 Pieces published by YBCA in San Francisco. Available at Galleria S.A.L.E.S. The exhibition title The Great Tidal Wave Played a Final Tune On This Piano, comes from a message that was written on an old photo-postcard of an abandoned piano that was washed up on a Hawaiian beach by a tidal wave in 1946. Throughout this exhibition Macdonald explores how noise becomes evident as different forms of interruptions of signals and messages. The exhibition involves early messaging systems such as postcards as well as other types of organizational structures such as language, as well as musical notation, the system used to represent the aurally perceived music. 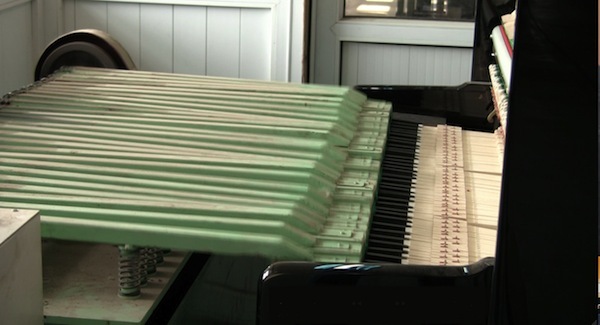 In this case, Macdonald attempts to use musical notation to represent and organize the noise from a factory piano testing machine featured in his video 9,000 Pieces. 9,000 Pieces features a “Repetition and Responsiveness” testing machine that was shot by the artist at a musical instrument factory on the outskirts of Shanghai, China in 2010. During the course of the five minute video Macdonald carefully documents the various moving parts of a factory machine designed to test the endurance on the products it manufactures. In a sense the testing machine compresses time as it simulates a life time of use on the instrument. Recent exhibitions include the solo show 9,000 Pieces, Yerba Buena Center for Contemporary Art, San Francisco, 2011; TAKE THE DARK OUT OF THE NIGHT TIME, Arrow Projects, Beijing, 2010.